The culture360.org correspondent Veeranganakumari Solanki was in Kochi, India for the opening of the first ever Biennale in the country. She interviews here the initiators and curators Bose Krishnamachari and Riyas Komu on the success of this first edition. Veeranganakumari Solanki: India’s finally got its very first biennale with all the efforts you have put in along with your team. There have been controversies, difficulties, funding issues and several hurdles that you have overcome to ensure the opening of the Kochi-Muziris Biennale on 12/12/12. Could you briefly describe the build up to this? Bose Krishnamachari and Riyas Komu: The cornerstone that we stood on to organize the biennale is our vision and the determination. Our vision is all about what a biennale can do to the Indian art community as a whole, and the contributions it can make to better the art infrastructure in the country. We believed, and still do, in encouraging Indian artists to think out-of-the-gallery and beyond its confinements. Yes, there were controversies and hurdles all along the way. Looking back now, we too are amazed at the hurdles we have crossed to reach this far. The first publication from Kochi Biennale Foundation has been aptly titled, ‘Against All Odds’. If not for our focus on our vision and determination, we could have conveniently backed out and stopped the journey half-way through. We have to thank other members of the Foundation and a young team who have worked day in day out to pull it off. VS: At the opening of the Biennale, there were still some works that were being installed. While it is easy for most to criticise, these issues have also been looked upon as teething problems, which quite certainly will be resolved. One has been reading a lot about it from an outsider’s perspective; it would be interesting to have your response to this situation. BK and RK: When we began chasing the dream of organising India’s first biennale, we had nothing to start with other than controversies and allegations. We had to start from scratch. Since there were no good exhibition halls, we had to hunt for venues and finally zeroed in on the disused colonial buildings in and around Fort Kochi. Everything boils down to funds, especially when it comes to organising a large-scale event like a biennale. From the very beginning we have faced funding issues and it has affected many levels of operation. Remember, it is the first biennale in India, and even though we have been to many biennales, it has been a learning curve for us as organisers of a biennale. There are so many logistical nuances which could hold up things. If there were enough funds, everything could have overcome on time. Yes, some of the projects did drag beyond the opening day but now things have fallen into place and it looks a lot tidier. In fact, we knew some of the things would not be completed on time but look at the larger context of the achievement of the first biennale in the country! VS: While being the founding members of the Biennale, both of you also took on the role of Curators and Programme Directors. Could you talk about your experience in handling logistical issues, alongside administration and curatorial work? BK and RK: As we said earlier, there are so many little things that could hold things up. Curatorial work was comparatively easier than the logistical and administrative ones. As artists, we could get under the skin of an artist and understand his or her needs. 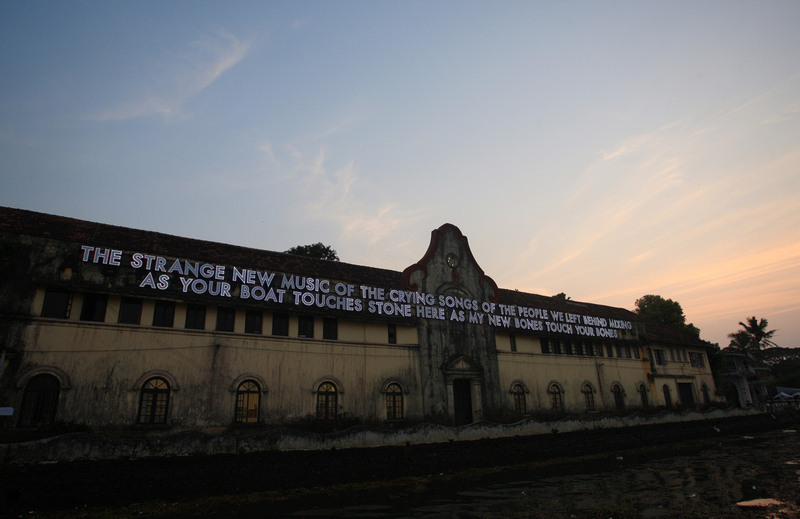 For the Kochi-Muziris Biennale we have tried to give maximum freedom to every artist within our conceptual scope. It was not our curatorial responsibilities that have stood in the way of logistical and administrative work but shortage of resources in funding. If the Kerala government had not backed out from supporting the biennale financially, our logistical and administrative works would have been a lot easier. But, that does not take the sheen out of the quality of artwork and the ‘biennale experience’. VS: The spaces you selected for the Biennale were alternative spaces that worked well with your selection of artists and their works. Will these continue to be future venues for the Biennale or will there be changes? BK and RK: It is too early to comment on the next edition’s venues. It will largely depend on the next curator/s. VS: Could you also talk about your curatorial selection of artists from India and internationally as well as the response you received from artists, curators and the art fraternity? BK and RK: Our curatorial selection was mostly done in accordance with the concept of the biennale which is a merging of the cosmopolitan past of Kochi and Muziris and its present. We invited artists who have been working with history—be it narrative, memory or material. The response from artists and curators and art world has been ‘super-exciting’. They have considered and understood the shortcomings and the state of being ‘work in progress’ and have appreciated the quality of selection and artwork at display. It has also been an eye-opener and a new experience for many of Indian art lovers and artists. Despite the controversies and allegations, there has been an overwhelming sense of participation and sense of ownership from art community across the country and local people here in Kochi. VS: Kochi has officially been named the “Biennale City”, which is certainly going to enhance it in terms of cultural tourism as well as make it a significant place on the Indian map. What about Muziris? BK and RK: Muziris, Kochi’s predecessor, was the ancient port town in the region which had trade links with the Romans, Greeks, Jews and Arabs. The government has under taken a Muziris Heritage Project to promote cultural tourism along the ancient Spice Route. VS: Could you talk about the biennale within a local context, the impact it had on the local communities and the reactions it received? BK and RK: The Biennale has been a new experience for the local people, especially viewing contemporary visual art in these colonial buildings is a unique experience. For local artists—22 of them are part of the biennale—getting to exhibit at a platform like a biennale and getting an international exposure are surely biennale bonus. VS: How do you envision the future development of the Biennale? BK and RK: We had started from scratch for the inaugural edition, and the confidence that we have gained in organising the first biennale in India—proving the detractors that a biennale is possible in this country—is a huge plus and the springboard for future editions. The success of the first edition has given corporates and individuals the confidence to back the biennale in the years to come.